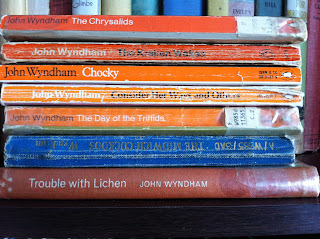 John Wyndham is an old friend of mine in my bookcases. As I commented on Peter's blog, my somewhat battered collection date from many years ago and have none of the schmick glamour of his nice new ones. His response was that mine are probably collector's items now. I'm not so sure of that really - they're a bit bashed around through much use. Most of them are Penguin Classics, one of which was converted by the library from which I bought it into a hardcover by pulling the covers off, pasting them onto hardboard and then sticking it all back together again with book tape! My copy of Trouble with Lichen is the odd book out, being a lone hardcover - with very contemporary ink illustrations dotted through the pages. My all time favourite is The Chrysalids. We studied it at school, early in high school - and this is my copy from then! I think we did The Day of the Triffids as well, I can't quite remember. My school buddy who follows this blog might recall.... The Chrysalids was the first time I'd read anything in the SF genre that wasn't some big inter-galactic battle or that had a primary focus on technology. I had read the John Christopher trilogies - The Tripods and The Prince in Waiting - which are set, like The Chrysalids, post apocalypse, when the world and society is reduced back to much more primitive styles of living after the havoc wrought by the abuse of technology. 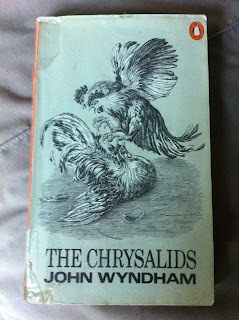 The Chrysalids is, like most of Wyndham's writing, focused on the human condition; the human and emotional experience of whatever situations he writes for his characters. In The Chrysalids, we find a community that is deeply rooted in old Biblical precepts of what constitutes God-like perfection of species - man, beast and plants. Without it being spelled out how they come about, the reader learns that in these small communities there are deformities that must be rooted out and destroyed, and they are there because of the sins of those who came before and caused the wastelands at the perimeters of their useable land. David Strorm is the son of one of the leaders in his community. Strorm senior is one of the most rigid enforcers of the laws that state any deformed plant or beast on his property must be destroyed. David is something of a loner, separated from his nearest siblings on either side by large gaps in years that are unexplained, although has has hazy memories of babies being born, babies that didn't live. There is also the puzzling awareness of the unexplained fact that his father, owner of the family property and head of the familiy, is the second son... And then one day he meets Sophie, a little girl with six toes on each foot. He discovers it when she is hurt and he has to take her shoe off to free it from where it is caught. Her parents swear him to silence, but to himself, he starts to question - how could two tiny toes make small girl evil? There is also the close communication he has with his cousin Rosalind, which he learns early to not mention - initially just though an innate sense of caution, later as he realises that it is something that makes them different. And there are others...friends in the area with whom he and Rosalind can also communicate, mind to mind. They don't understand what it is, but as they grow older and more aware of the potential dangers, they grow closer and more cautious. The David's little sister, Petra is born. Passed by the local authorities, she is another 'perfect' child born to the Strorms. A few days later, David's aunt arrives with her baby, also just born. Unlike Petra, this child has a minor defect and she begs David's mother to substitute Petra for the inspection to gain a certificate of purity for her baby. She is refused, and this is her third 'imperfect' child. David's father hounds her from the house, calling her a blasphemer. The news comes later that her body has been found in the river. Losing a third child breaks her. By now, David is very aware that his ability to communicate with the others via their thoughts - a form of telepathy - would be seen equally as a deformity and is very frightened. However, they have all grown up being cautious and protective of their secret, and so they stay until the day when the eight of them discover that they have become nine. David, in the middle of the fields helping with the harvest, is struck by a severe pain in his head and in imperative so strong that he just bolts from the fields in response to the unspoken call - it is six year old Petra who, playing, has fallen into a pond and is drowning. In her panic, she unknowingly transmits. her panic He signal was so powerful it also brings Rosalind and they realise the dangers of any number of them converging on a spot due to a summons that nobody else will have heard. The next crisis comes when another of the girls, Anne, decides to marry - outside their group. They all understand the dangers, but she is not to be persuaded otherwise. When, in order to protect them, David's uncle - the only one not of their group who knows of their gift - has the young man killed, Anne denounces them. They flee, heading for The Fringes - outlying areas where it is known mutations occur with frequency. The Fringes are populated by those humans judged mutant in infancy; sterilised and cast out to survive or not, they live, struggling for survival in an anarchic world of basic survival. There, Sophie, David's childhood friend who was eventually caught, surfaces and elects to help them. There too is David's uncle, his father's older brother, a man with grossly overlong limbs on a stunted torso, who is an embittered man of considerable power who rules over the little community. Petra's extraordinary signals have been picked up by others on the other side of the world, who come from a community where everyone can communicate telepathically and it becomes a race against time as the Sealanders travel to rescue them, those hunting them close in and a clash between the 'righteous' and the inhabitants of The Fringes begins. 'So you're in love with her?' she went on. A word again... When the minds have learnt to mingle, when no thought is wholly one's own, and each has taken too much of the other ever to be entirely himself alone; when one has reached the beginning of seeing with a single eye, loving with a single heart. enjoying with a single joy; when there can be moments of identity and nothing is separate save bodies that long for one another... When there is that, where is the word? There is only the inadequacy of the word that exists. 'We love one another,' I said. 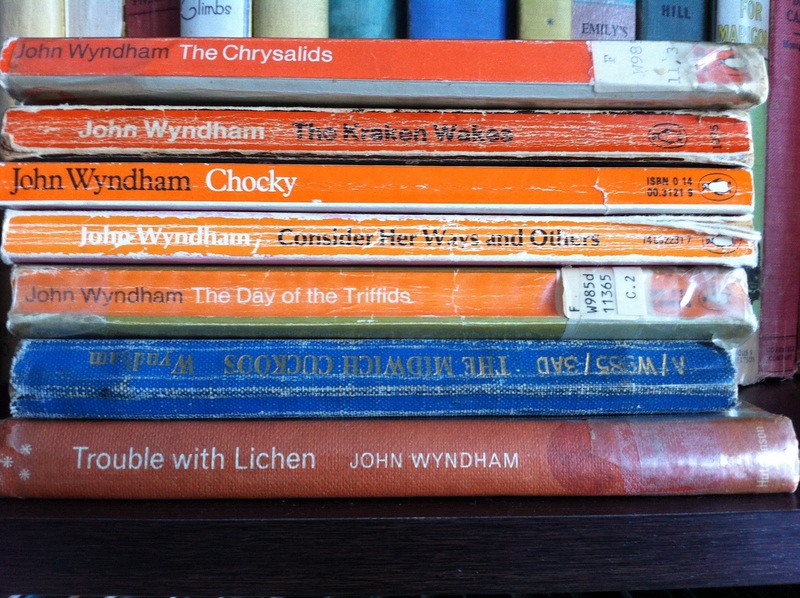 For those of you who have yet to discover Wyndham's writing, look for the books. As Peter discovered, Penguin have recently re-published them in paperback. He got his copies in a Kinokuniya store. We have one of those in Sydney and I'll he heading over there to see if I can track down a copy of the volume of short stories that I don't have... Otherwise, go check out your local bookshop and give yourself a treat of some exceptionally timeless writing! 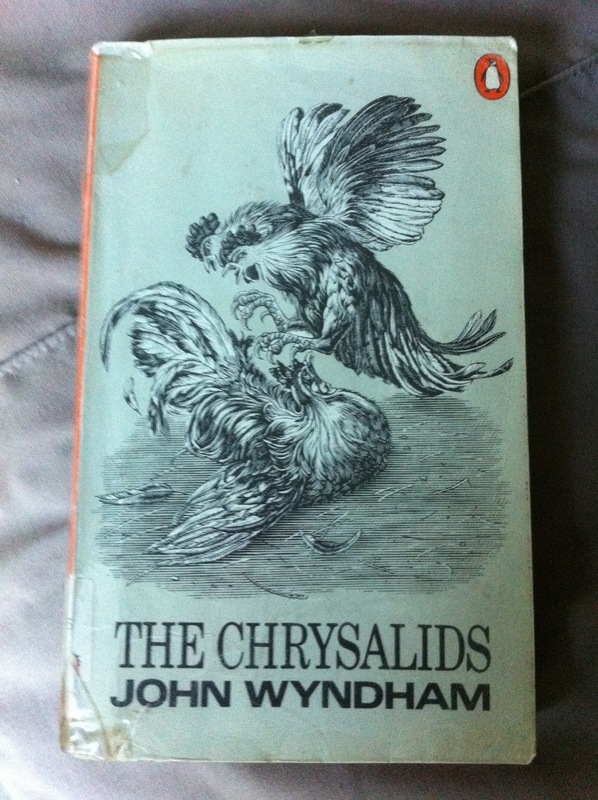 Hi Kaz, I just had to comment, I also love Wyndham and have a particular fondness for The Chrysalids, I have an old penguin edition with a weird bug creature on the cover. It would have to be one of the worst covers in the history of publishing but I do love the novel. It is a novel I reccomend to young adults into dystopian fiction because I think it is a great example of the genre and it is just such a great novel. Now you have me thinking about re-reading Wyndham, he really is an author who has endured and his work still seems so relevant. Loved your post. Thanks for dropping by and thank you for your comment. Do you know, it took me years to really look at the birds on the front of my copy and notice the multiple heads... Notwithstanding that, I recommend this particular book to anyone who's not read Wyndham. People are more familiar with The Day of the Triffids, because of the various adaptations that have been made, but I think this is truly one of his best. Peter's got me started now - having got stuck into this one, I'll be working my way through the rest now because once I start, I can't stop reading them!! Such a pity the dear man died and didn't write more of them! So good to know this book is still actively being read - and not just by odd vintage fans like me! I'd love to see it - and the others - back in the school syllabus. There's a lot to be learned from Wyndham's writing.